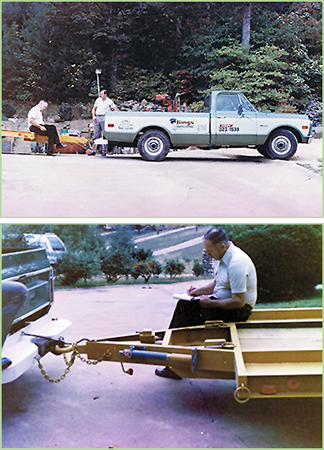 It was a different era in 1959 when Mark King's father, Elbert King, started a landscaping company in Darien, IL. With only a few part-time employees on staff, Elbert worked rigorously to develop a business that would help support his family and allow him to work creatively. Mark started working for his father at an early age, doing what he could to help support the fledgling company. He learned every aspect from planting and design to managing and installation by the time he took over in the early 80's. In 1988, the same year the company was officially incorporated, Mark took over operations as President of King's Landscape Design. King's Landscape Design has continued to grow over the years because of its commitment to customer service. Quality materials, unique designs, professional installation, and communication are all synonymous with customer service. To this day, it's still all about the customer. Although new customers are a clear sign of growth, it is our returning clientele, year after year, that speak volumes of the distinct work King's Landscaping Co. has provided since 1959. Currently, Mark's wife Noel serves as DOO of King's Landscape Design. She has maintained an integral role in facilitating all administrative duties, allowing Mark and his team to concentrate on their passion: bringing home entertainment and enjoyment opportunities to the outdoors. As a recognized leader in the landscape industry, it has become a pressing issue to develop innovative landscape design and installation techniques to improve the world around us. Within the office and out on job sites across the Chicagoland area, King's Landscape Design is dedicated to providing an elite level of service our clients have come to expect. And with that mentality, we hope to have you as one of our clients for many years to come.